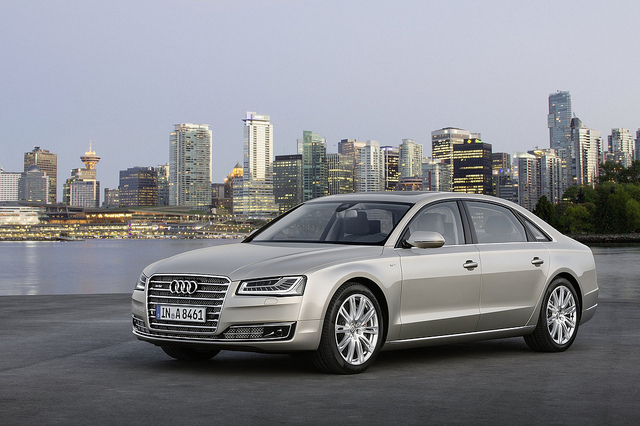 The Audi A8 offers both drivers and passengers heated seats with 12-way power adjustment. The driver’s seat has power lumbar support. The sedan also includes a thick steering wheel that tilts and telescopes, a high contrast instrument panel with dashboard controls that are larger, and keyless entry and start. In addition to a rearview camera, the Audi A8 has front and rear parking sensors. The 333-horsepower, 3.0-liter V-6 engine achieves an estimated 18 mpg in the city and 28 mpg on the highway. The Audi comes with an eight-speed automatic transmission and all-wheel-drive.